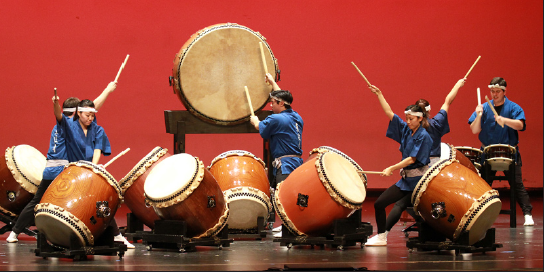 Pasadena-based community taiko ensemble Makoto Taiko will present its 17th annual concert, entitled “One PULSE,” on Saturday, June 4, at Occidental College’s Thorne Hall in Eagle Rock. Doors will open at 6:30 p.m. and the concert begins at 7 p.m.
“One PULSE” will feature Makoto Taiko’s signature repertoire, which includes traditional taiko pieces as well as original contemporary compositions that pair taiko drums with other Japanese and Western instruments. The 80-member ensemble will share the stage with acclaimed guest musicians, including koto artist Yukiko Matsuyama and violinist Jason Yang, as well as Grammy Award-winning taiko master Koji Nakamura. Nakamura started his taiko career in Japan with renowned taiko group Ondekoza. Subsequently, he established the Shumei Taiko Ensemble in Japan before he relocated to Los Angeles to assume the role of artistic director and head sensei with Makoto Taiko in early 2000. Nakamura has performed at notable institutions worldwide, including the Parliament of World Religions in Capetown, South Africa and the United Nations headquarters in New York. Matsuyama bridges eras and cultures for diverse audiences through the koto. She has performed with Shakira at the Latin Grammy Awards, collaborated with Paul Winter on his Grammy Award-winning album “Miho: Journey to the Mountain” (Best New Age Album), and shared the stage with Motown legend James Gadson. Yang has become one of today’s most popular sensations on the acoustic and electric violin circuits in the U.S. and abroad. With over 186,000 subscribers and over 31 million views on his YouTube channel, he reaches diverse audiences through multiple genres of music and is recognized for his versatility on multiple instruments as well as his abilities in composing and producing. He has performed all over the world with Madonna as her violinist. In 2012, he completed the MDNA Tour, which consisted of 88 sold-out shows throughout Europe, North America, South America, and the Middle East. Makoto Taiko’s annual concert is one of the ways that the group seeks to advance its mission to unite people of all backgrounds in local and global communities by preserving and sharing the spirit of Japanese taiko drumming through performances, classes, and other charitable and educational activities. Additionally, generous funding from the Aratani grant will allow Makoto Taiko to broaden its community outreach by developing a series of taiko workshops for middle school and high school age youth. More information on the upcoming concert, community classes, and workshops can be found online at www.makototaiko.org. General admission tickets are $15 and are available for purchase at http://makototaiko.brownpapertickets.com/.